Do you have a great garden centre or work in a garden centre but want to improve sales skills? This industry-focussed 20 hour sales skills course is aimed particularly at garden centres sales staff. Input from the Garden Centre of Australia Association and the writing of professionals in this field, has allowed this course to focus on what is important in keeping a garden centre in business today in a highly competitive environment and to help it thrive. It aims at taking the sales team to the next level in an easy to achieve online course – lots of advice and techniques along with suggested tasks in each lesson to further expand the student’s learning experience and knowledge. Tests at the end of each lesson and a longer one at the end of the course allow the student to monitor their own progress and (if successful) gain a Letter of Completion at the completion end. Who would Gain from doing this Course? Garden centre sales assistants looking to improve their sales skills. Small garden centre owners looking to improve their own sales skills. 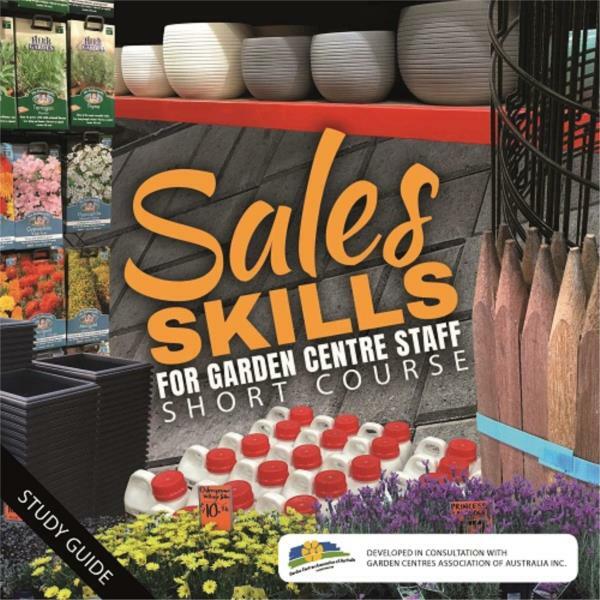 Large garden centres looking for an easily accessible training program for their sales staff –one that has input from industry professionals. School leavers who would like to work in nursery sales and have completed or want to also complete a horticultural qualification. It is purely sales focussed - builds extra skills for those with horticultural background or knowledge. It can be done within 20 hours of study - learn more skills quickly, easily and within your own home or work environment. Input from industry gives the learner or garden centre manager confidence in what is being taught. It isn’t intimidating, yet it is still informative and a great way to quickly expand those important sales skills. Learning not only boosts sales-skills it encourages confidence, improves self-esteem, and engenders pride in a job. Know how to open and close sales. Understand that product knowledge is important in selling. Know the place that marketing has in sales and useful marketing techniques. Learn communication skills and techniques and their importance in selling. Become a true horticultural sales professional. Automated self assessment tests pop up at the end of each lesson.You can attempt these as many times as you wish; and each time, upon completion, you can see your results.You will need internet access to complete the self assessment tests.